The TFT Foundation’s documentary, “From Trauma to Peace”, is in post-production and almost complete. I will post when the DVD is available. Our new trailer gives an inkling of the power of the stories told. Please share it to give people an idea of the real possibility for peace in this world. One of the worst disasters is when a country or a people are subjected to genocide. 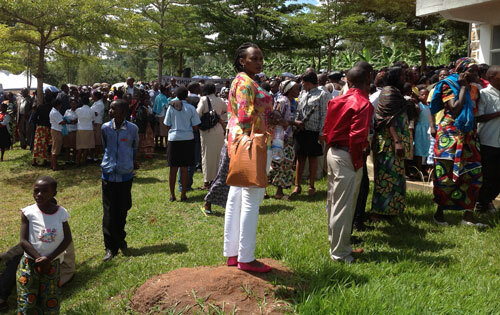 Last month was the Mourning Period from the 1994 Rwandan Genocide. TFT is playing a key role in the healing of that nation through the work of the TFT Foundation. From the teachers in schools to the inmates of prisons, they are using TFT to heal from the atrocities of their past, bringing forth love and peace within their communities. I want to share a small piece from an email I just received from Celestin Mitabu, one of our Rwandan TFT trainers in Kigali, Rwanda. “This picture was taken during TODAY’S treatment at Kamonyi genocide site where TFT was invited officially by the District of Kamonyi to heal, assisting people traumatized with the Callahan Techniques TFT. The memorial site has got thirty-eight thousand bodies plus 36 bones recovered recently and they were buried today. This was a huge cloud of thousands of people led by many politicians, police, survivors and armies. Thank you Celestin and your team for your hard work and dedication to help so many begin to heal. On June 22 and 23, 2012, approximately 45 wounded warriors and some family members came from all over the US (a smaller group than in the past) to Connecticut for a weekend of water skiing, boating and kayaking. We also had several first responders, firemen, and a para-olympian in ice hockey. One young fireman came who had been in a fire and had lost 4 of his buddies on 911. Since that time, as told by his wife and sister, he had become unresponsive and in a deep depression. Over the years, there had been no change in his condition, in spite of medication and psychiatrist visits. His wife and sister came to me and asked if I could help him. I said I would try, if he wants me to. I gave them a brochure about TFT and a copy of the TFT Trauma Relief tapping sequence to give to him. He received it, and after about 10 minutes I approached him and asked if he would like to try the technique. He said yes he would like to. After checking him for psychological reversal and correcting it, I had him tap the pain and then trauma tapping sequences. We went through the sequence once and he raised his hand and slapped me a high 5 and had a slight grin on his face. We continued with the 9 gamut and repeated the tapping sequence one more time. His SUD [Subjective Units of Distress] went from 11 to 8 to 5 to 2 and finished with the floor to ceiling eye roll. He got up off the bench and gave me a hug with a big smile on his face. Two hours later I found him Kayaking with his wife and the following day he went water skiing with some of the other vets. One of the firemen from New York City who was a first responder to the 911 had been watching me working with the vets. He said that after the trauma that the firemen suffered, the city brought in several counselors to help but it had little effect on the firemen. Then a couple of TFT practitioners from New Jersey came in and the firemen began to heal. He was very excited about TFT. At the end of the weekend Wounded Warriors weekend with Leaps of Faith, I had helped 22 Vets and firemen begin healing their post traumatic stress and many others took home the Trauma Relief Technique I printed out from the TFT Foundation’s free Trauma Relief web site, www.TFTTraumaRelief.wordpress.com. I have received many thank you cards and emails from the Vets and families. Please share this site with all you can, it can make such a difference in their lives. Thank you Callahan’s for TFT and the TFT Foundation for these resources. If you would like to help share TFT at one a future event, please contact me at pjpathways@webtv.net. Ruth tells her story of living in Austria when Hitler came to power and the effect of those events on her life. Working with Dr. Bray and using Thought Field Therapy helped her gain peace and relief from Traumatic Stress.